Nitrogen Generators provide a number of benefits for users, including the fact that they are easy to operate and maintain. Once installed on site, users can expect little to no upkeep to keep the N2 Generator working efficiently and effectively. The South-Tek Systems PSA Generators are designed to last for 20 years or more with little to no preventative maintenance. The only necessary maintenance to ensure optimal working condition is a quarterly filter change that can be done directly by the user in just minutes. The filter simply twists on and off by hand. South-Tek Systems makes it as easy as possible to order replacement filters. We have a form on our website for N2 Generator Filter Replacements Products that can be submitted online at any time. Simply complete the form with as many details as possible, including the model and serial number which can be found on the sticker on the front of the generator, and click on 'Submit.' We will get right back to you to confirm your order and to discuss options, availability, and pricing. We will also send reminders when filter replacements are due so you can count on us to keep you on schedule. The easy and affordable long-term maintenance of our Nitrogen Generators add to the overall benefits you can expect when you replace your bulk N2 gas supply with an on-site Nitrogen Generator. 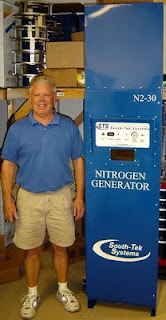 Contact the experts at South-Tek Systems to learn more about the advantages of investing in an N2 Generator for your plant, facility, lab, or processing center: 888-526-6284.